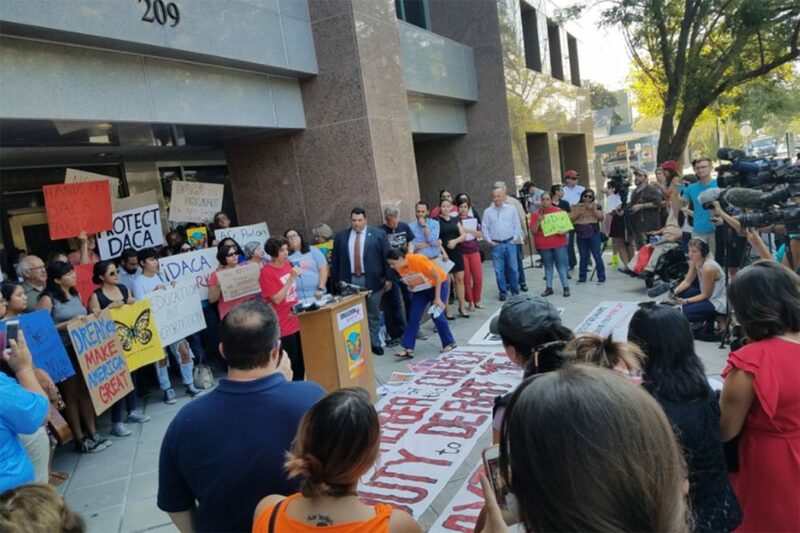 DACA supporters held a press conference in front of the Texas Attorney General’s Office in Austin on Tuesday, Sept. 5, 2017, after the Trump administration announced the program was ending. Just 1 in 5 Americans want to deport young immigrants brought to the United States as children and now here illegally, the focus of a politically fraught debate between the White House and Congress. Americans also have largely negative opinions about President Trump’s signature immigration pledge to build a wall along the entire U.S.-Mexico border, according to a new poll by The Associated Press-NORC Center for Public Affairs Research. Just under half — 49 percent — oppose construction while 32 percent support it. On Sunday, Trump told lawmakers his hardline immigration priorities, including the wall, must be approved if he is to go along with protecting the young immigrants from deportation. 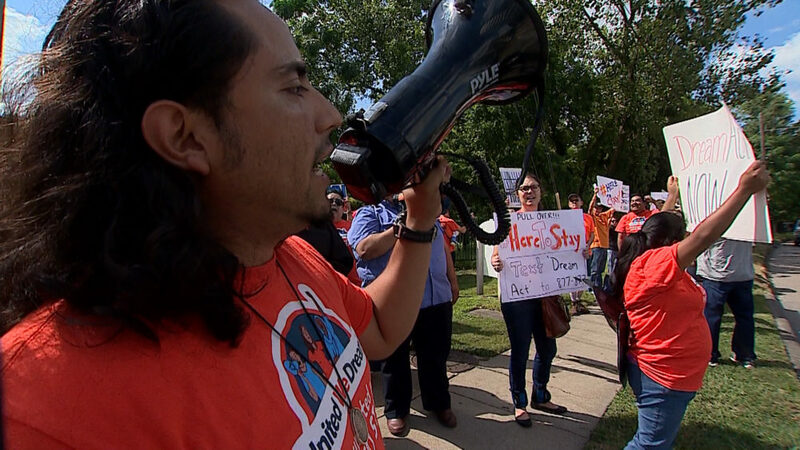 About 800,000 young immigrants had been given a deportation reprieve under President Barack Obama’s Deferred Action for Childhood Arrivals, also known as DACA, until Trump ended the program last month. He’s given Congress six months to act. About 60 percent of Americans favor allowing those young immigrants, commonly referred as “Dreamers,” to stay in the U.S. legally, compared to 22 percent who are opposed. Just 19 percent of respondents say all these childhood arrivals should be deported. Sixty-eight percent of Hispanics, 61 percent of blacks and 57 percent of whites favor extending protections. Eight in 10 Democrats favor allowing the young immigrants to stay legally. So do more than 4 in 10 Republicans. Showing sympathy for the young immigrants does not always translate into softer views on immigration. Catello, for example, favors the construction of a wall along the Mexican border. Among those who favor a border wall, 38 percent also favor allowing “Dreamers” to stay. When Trump ordered the phase-out of the DACA program last month, he gave 150,000 young immigrants the chance to quickly renew permits that are to expire before March 5. Officials say that more than 35,000 didn’t make his Oct. 5 deadline. And many others will see their status begin expiring after March 5, unless Congress acts before then. Trump suggested at the time that he was eager for a deal to settle the matter, telling reporters, “I have a love for these people and hopefully now Congress will be able to help them and do it properly.” He also tweeted that if Congress was unwilling to find a fix, he would “revisit this issue!” in six months. 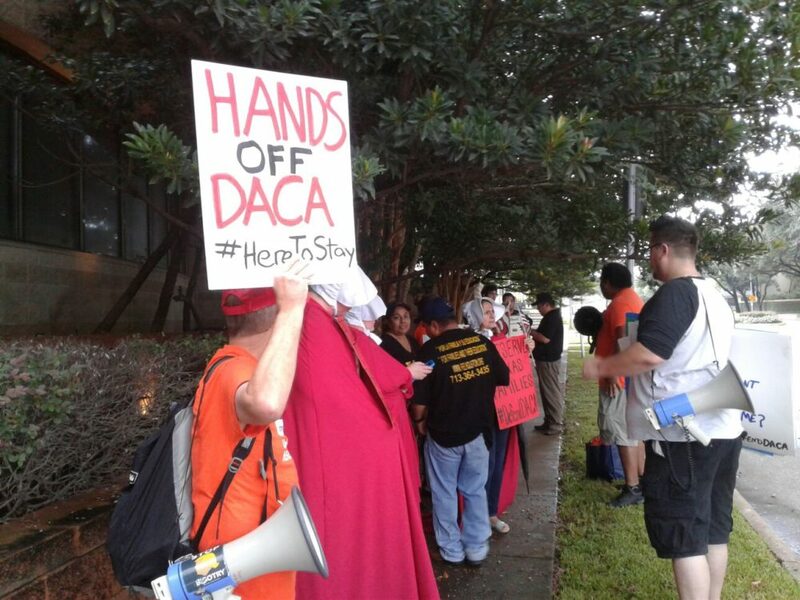 Houston dreamers protest against Texas Attorney General Ken Paxton who was visiting Houston on August 8th, 2017. Trump had previously said he wanted a DACA deal to include significant money for border security and eventual funding for the wall. But the priorities released by the White House this week went far beyond that. The White House’s demands include limiting green cards to spouses and minor children of U.S. citizens and lawful permanent residents, hiring 10,000 more immigration enforcement officers and making it easier to deport unaccompanied children. The White House says the measures are to soften the impact on the U.S. caused by granting benefits to DACA recipients. Carolyn Kurtz, a 62-year-old retired engineer from Monument City, Colorado, who wants protections for young immigrants, said Trump hasn’t done “the research necessary” on immigration. Two-thirds of Americans — 64 percent — say they disapprove of Trump’s handling of immigration, and a similar percentage — 65 percent — say the same of his handling of foreign policy. Both of those are similar to Trump’s overall approval rating. The poll also revealed more Americans favor than oppose another aspect of Trump’s immigration policy — his latest travel ban. Forty-four percent favor it compared to 37 percent who say they are against the new rules. In September, the administration announced the most recent restrictions which affect citizens of Chad, Iran, Libya, North Korea, Somalia, Syria, and Yemen — and some Venezuelan government officials and their families. They are to go into effect Oct. 18. It was the administration’s third try at limiting travel after a broader ban sparked chaos in January and was challenged in courts across the country.